Welcome to Aegis Immemorial.com: Death's White Hands: Cover Reveal!! 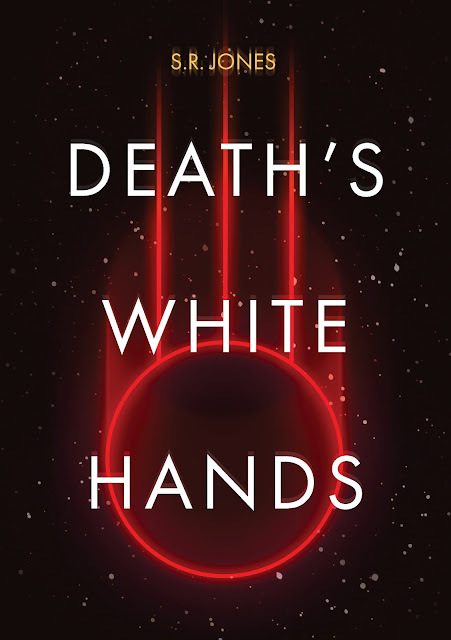 Halloween is here, and surely there's no better time to show off the brand new cover for Death's White Hands: A Tale of Aegis Immemorial! A huge thank you is in order for Becca Carey (@Becca_See on Twitter), who designed the cover for me along with the amazing meteor symbol, which you will be seeing a lot more of in the future! Please go and check out her work because she's awesome! And this isn't the only bit of news I have to share with you today. As promised, you can now download and enjoy The Corpseriders- a brand new 7000 word short story set in the world of Aegis Immemorial! Consider it a taste of things to come, and since it's completely free, please feel free to pass it on to your friend, family, pets, and anybody else who you think might enjoy it! And don't forget, in just 4 short months, Death's White Hands will be launching on Kickstarter. There will be some awesome backer rewards (and some very unique ones!) and I am in the process of sourcing and costing some fun possibilities for stretch goals. In the meantime, though, you can find the link for The Corpseriders at the bottom of this post, and I sincerely hope that you enjoy reading it as much as I enjoyed writing it! Get your FREE COPY from Smashwords here!